The coach of Devon swimmer Antony James says his Olympic dream is not over despite missing out on the qualifying time for London 2012 by 0.1 seconds. 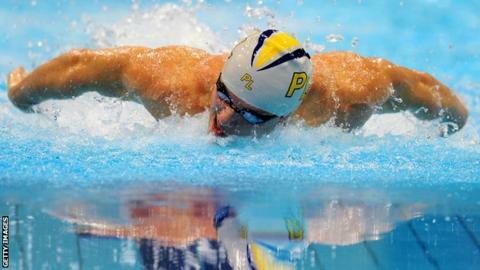 James won the national 100m butterfly title in Sheffield on Thursday. But he will have to wait until a selection meeting on Saturday to find out if he will swim at the Olympics. "The good thing for Antony is that there's only one guy on the team who can swim the 100m fly at world level," John Rudd told BBC Radio Devon. "He does also have the Olympic qualifying time within the designated period, so he has two good strings to his bow when it comes to the selection." Stockport's Michael Rock has already been picked to swim in the 100m butterfly at London, but only finished seventh behind James in Sheffield. "He [James] is national champion and has beaten all his rivals," added Rudd. "The meet ends on Saturday evening and the selection panel will sit that evening and decide on what swimmers they want to make up the team. "We've just got to sit it out and wait for the meet to finish and see what comes of it."